Before the advent and widespread use of electronic key control systems, key management was often a haphazard process. Many multifamily communities used an honor system to store and control building keys, while institutions such as correctional facilities or medical campuses used a more formal system requiring access activity to be hand-written in a log book. The procedures were often ineffective and laborious, leaving the organization exposed to unnecessary premises security liability. Electronic key control systems resolved these challenges with the implementation of authorized user codes and automatic tracking of key access activity. The automated systems made it easy for users to access or return keys with designated key slots and online monitoring for tracking key usage. Today, the most advanced key management solutions have even more of a convenience factor while maintaining simplicity of use. 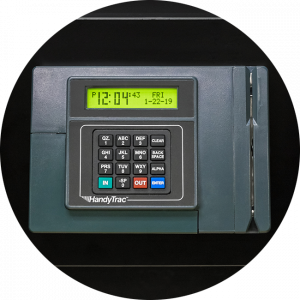 The HandyTrac Touch system, for example, features a user-friendly interface with large buttons, a touch screen display and integration features for Yardi and ResMan users. Compared to the old, dog-eared logbooks, today’s electronic key control solutions have made the task easier and more reliable. All of our systems come with a stout 18-gauge steel cabinet, electronic key locking mechanism, and computerized datalog. Additionally, property managers can run activity reports, view work orders, and more from any internet-enabled device. Our Classic system offers several features to customize your experience and help protect your investment at an affordable cost. Taking key control one step further, our Biometric system has all the features included with the Classic, plus a biometric fingerprint verification scanner. This provides added security as only authorized employees verified via their fingerprint may access the system. Lastly, the Touch system combines biometric technology and a large touchscreen display in a single unit to offer the highest level of security, reporting, and flexibility. For more information about our electronic key control systems, contact us today.